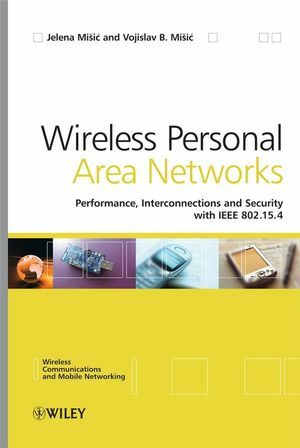 Wireless Personal Area Networks provides an in-depth analysis of the recent IEEE 802.15.4 standard for low data rate wireless personal area networks (LR-WPANs), including suggestions to improve performance and comparisons with the related 802.15.1 (Bluetooth) standard. It assesses the suitability of the standard for the development and deployment of wireless sensor networks as well as providing guidance and insight into the relative advantages and disadvantages of various performance solutions. Provides a comprehensive, in-depth look at the issues surrounding WPAN network operation and performance. Investigates multi-cluster networks and compares how they can be implemented. Analyzes the performance of a single cluster under different traffic and power management regimes including uplink vs. downlink traffic, acknowledged vs. unacknowledged traffic, saturation vs. non-saturation, and the like. Discusses security issues in WPANs such as different security threats, their impact on performance, standard security mechanisms, and security policies. Compares the IEEE 802.15.4 standard with the related Bluetooth IEEE 802.15.1 standard in terms of suitability for implementing wireless sensor networks. This reference is a valuable tool for developers and researchers getting acquainted with various aspects of IEEE 802.15.4 technology. Graduate students studying courses such as Performance Evaluation, Wireless Sensor Networks and Queuing Theory will also find this book very insightful. An associate Professor in the Department of Computer Science at the University of Manitoba, Canada, Dr. Misic’s research interests include wireless sensor networks, WPLANs, WLANs, AD-HOC networks, mesh networks, network security and performance evaluation. Misic has won several awards including Best Paper of the Workshop award at the Proc. HWISE 2005 workshop in the IEEE ICPADS 2005 conference, Fukuoka, Japan. Dr. Misic is also the author of Performance Modeling and Analysis of Bluetooth Networks (crc Press 2005) as well as numerous book chapters and journal papers. Dr. Misic is an Associate Professor with Tenure in the Department of Computer Science at the University of Manitoba, Canada with research interests including service based computing, performance analysis of wireless ad-hoc and sensor networks, and software engineering. The co-author of several books in Serbian and Performance Modeling and Analysis of Bluetooth Networks (crc Press 2005), Dr Misic has also contributed chapters to other books and published numerous journal and conference papers.